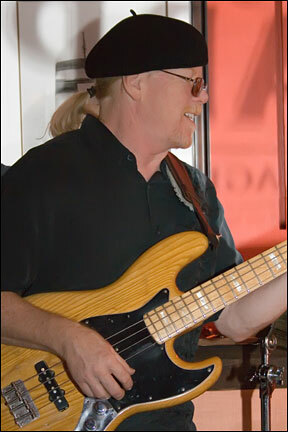 A Berklee College of Music alumnus, Rusty has been playing bass for over thirty years. His musical experiences range the gamut, from funk, R&B, jazz, and symphonic work to stints at Walt Disney World, The Ringling Brothers & Barnum and Bailey Circus, and The Big Apple Circus in New York City, and the Montreux Jazz Festival in Switzerland. Rusty has performed with many varied artists as well, including vocalist Lou Rawls, The Chiffons, Danny and the Juniors, The Four Lads, jazz greats Eddie Harris, Ritchie Cole, Bill Evans, Charlie Byrd, Mose Allison, Ira Sullivan, Rob Mullins, Tower of Power's David Garibaldi, and Rio Clemente. Over the years, Rusty has shared billing with many heavyweights in the music industry such as jazz legends Maynard Ferguson, Miles Davis, Dizzy Gillespie, Stanley Turrentine, Red Rodney, Weather Report cofounder Joe Zawinul, vocalist Angela Bofill, Kevin Eubanks (band leader of The Tonight Show with Jay Leno), blues legends B.B. King and Johnny Winter, The Temptations, and the Godfather of Soul himself, James Brown. Rusty has been teaching his students about the wonders of the bass guitar for over twenty years. In 1985 he designed and co-built a unique custom six string upright electric bass, dubbed the "Ram Bass" for its hand carved ram headstock. In 1991 he commissioned a seven string electric bass, the first of its kind, and was featured with the bass in Bass Player magazine. He currently resides in Florida, where he single-handedly supports the sun block industry.